The shark had been circling our boat for hours. I sniffed my hands. They continued to reek of fish. I scrubbed them for the 8th time with water hot enough to scald and foamy soap. I had already washed them with Dawn dish soap, peroxide, hand sanitzer and a bleach & water mix (not all at once, mind you!) and I had yet to remove the fishy stench. I guess this was the price you pay when you fish all day. Oh I’ve fished many other days, but I must confess, I have always managed to somehow convince either my husband or one of the kids to bait my hook and remove any caught fish. Hey, before you pass judgement: I spent years changing poopy diapers, so it was always kind of a pay-back in my mind. Today, however was different. My husband and son were fixated on catching a shark, and my daughter was languishing in the shade, still recovering from a sleep over ( you know, where the girls don’t actually sleep), so I baited my own hook. All day. If I hadn’t forgotten the actual bag of bait which by now was undoubtedly infusing the interior of the truck with an unforgettable aroma, aided by the closed windows and 96F temperatures, I wouldn’t have been scrabbling through gooey fish innards to bait my hook. Karma? Yeah, I thought so too. I am no fishing expert. In fact, out of our entire family, I am the least experienced. My step daughter taught me how to cast a line when she was three. I was fine as long as I used a spin caster reel. Everything else I managed to tangle in knots every time I cast out. 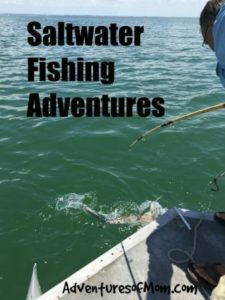 I joked that perhaps a cane pole was the best pole for me, then the last time we went out to the Gulf coast for some saltwater fishing, my husband actually showed me how to use a spinning reel. (He was probably getting exasperated about the lines as well). But the spinning reel was simple to use: flick the metal arm over (the bail), while holding the line with a right finger (while holding the pole), arm back, cast out and let go of the line at the same time and the perfect cast with no tangled lines. I was hooked! We headed out early on this Gulf Coast fishing adventure. It had been over a week since Hurricane Hermine had struck and the Crystal River floodwaters had long since receded. We did pass a “tidewater sale” sign at one of the downtown shops. A signpost by the Plantation Inn on Highway 19 stated that Fort Island Beach was closed until further notice, saving beach-goers the long drive out to that beach, and as we headed out on Crystal River ourselves, we soon learned why. It wasn’t from the occasional debris we spotted bobbing in the water. Right before Shell Island at the mouth of Crystal River, the whole area reeked of sewage. Hurricane Hermine’s legacy still living on, and making the place unsuitable for swimming! Or fishing, for that matter. We headed farther out into the Gulf and the saltier waters, but I did take note. If it took a week to reach the mouth of the river, how long until it polluted the gulf waters? The fish were not as active as usual on this trip, however my husband did catch a stingray. From the top, they look like a kite gliding through the water, but flip those babies over and they have a creepy face in a bit of flesh. And they have teeth! Who knew! They look like aliens! This one reminded me of that Oldest Human in a Doctor Who episode- the one who always says: “Moisturize me!” Yikes! My husband wanted us to eat it, but I made him let it go. It really freaked me out. I don’t know if stingray is good eating anyway, so this one got his freedom. My hands had already began to stink, and though I was tempted to wash them in the gulf waters, the shark swimming around our boat was enough deterrent for me to live with stinky hands for a while. I had brought hand sanitizer, but apparently it’s not strong enough to deal with fish guts. We caught the sun and eventually that Black Tip shark, returning to the stinky smells of the bait I had left in the truck. Looks like it might be shark for dinner tonight! And as for my stinky hands? My son suggested I cut off my nails and wash them again. It worked like a charm, clever boy! There are some license free days if you just want to try fishing. 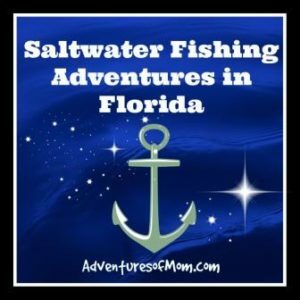 The Saltwater license free fishing days are: the first Saturday and Sunday in June, the 1st Saturday in September and the Saturday following Thanksgiving. All other rules and regulations still apply during those times too ( eg. bag and size limits). Though you can fish off of a dock or pier, even a fishing pier, a saltwater fishing trip in a boat is a memorable experience. If you go through a company, they usually provide the necessary licenses and sometimes even the rods & reels and bait, but not always, so inquire first. If you have a boat or are renting one, pack the necessary rods & reels, spare hooks of different sizes, and bait- yeah, don’t leave that bait in your car! Also if going DIY, check the weather before you launch. It’s a good idea to carry a smartphone with a weather app that gives you an up to date radar map with the weather so you know where storms are heading. Don’t get caught out in a storm. This is Florida and our weather always wins! Be smart. Be safe. Don’t forget to bring a cooler of ice, water to drink (or other beverages of choice), and food. Seriously, there is not much else to do out there but eat and drink. Hand sanitizer usually works for us (when not scrabbling through fish guts). I sometimes make sandwiches or buy some at Subway to take & chips or fruit- though everyone likes the chips better. Might be the salty air. Sun block is a must! There is sea around you, and even if you are in the shade, the sun bounces off the water and onto your skin. Music is a good idea too to pass the time or amp up the atmosphere. We like Jimmy Buffet and Bob Marley for Gulf Coast angling adventures. If you are bringing young kids, consider safety, shade, food and entertainment for them. Kids can tire of fishing easily. Bring something to amuse them with when that happens (it has always happened for us and still does). It’s hot on a boat, so remember shade: sunhats, an umbrella or even rig up sheets as shade. A lot of small boats have no toilets. Bring a bucket for emergencies. Check out the boating safety regulations before you go. There are certain items that must be on your boat, like a whistle, flare, life jackets for all persons and more. Check out the official list on their website (under equipment & lighting requirements). Kids 6 & under need a life jacket on at all times. Check the FWC website for more details. Anyone who cannot swim should wisely wear one too. Stay safe! A Florida Boater Safety Class for Kids that is Free! Previous Post: « A Florida Boater Safety Course for Kids that is Free!